A tooth believed to have belonged to Napoleon Bonaparte has sold for £11,000 ($19,000) at auction in Wiltshire. The canine is thought to have been pulled in 1817 when he suffered from a mouth inflammation diagnosed as scurvy. It was first passed by his physician Barry O'Meara to General Maceroni, aide de camp to the King of Naples. The tooth has now passed to a private UK buyer. It is believed to have been extracted during Napoleon's exile after defeat at the Battle of Waterloo. The hammer price was £11,000, so the Dominic Winter auction house in Swindon will also add on their premium to take the final sale price to nearly £13,000. It is believed the tooth was extracted during Napoleon's exile to the South Atlantic British island of St Helena, following his defeat at the Battle of Waterloo in 1815. "Historically, we know that Napoleon had toothache in 1816 and this was put down to a mouth inflammation diagnosed as scurvy," valuer Chris Albury said. "By the time of his death in 1821, he was a physical wreck and his gums were soft and bled easily and his teeth were loose. "In dental terms, this (the tooth) appears to be an upper right permanent canine of a male in his 40s. 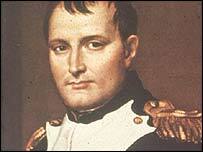 "This would fit with Napoleon's profile at the time O'Meara knew him."